Cardiovascular health and function. 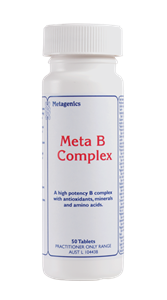 Broad spectrum antioxidant with mixed tocopherols and selenium. Support cardiovascular health and function. 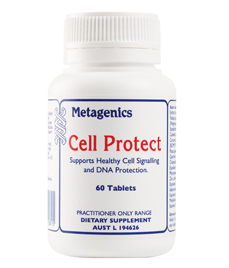 Provides broad spectrum antioxidant activity. Broad spectrum antioxidant activity: The synergy of mixed tocopherols has been shown to produce broader therapeutic antioxidant activity than a single tocopherol concentrate. Mixed tocopherols consist of mixtures of the natural tocopherol homologues: d-alpha-tocopherol, d-beta-tocopherol, d-gamma-tocopherol, and d-delta-tocopherol. 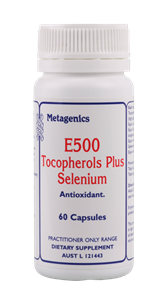 E500 Tocopherols Plus Selenium may help to maintain a normal, healthy cardiovascular system. A prospective, cohort study over two years reported a positive correlation between vitamin E supplementation and cardiovascular health. 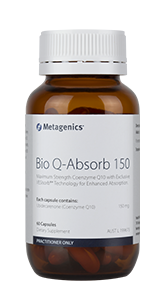 The mechanism by which vitamin E may maintain a healthy cardiovascular system is via the protection of lipids, DNA and proteins from peroxynitrite dependent damage. D-gamma –tocopherol in particular is required to remove the nitrating ability of peroxynitrite. Selenium provides antioxidant activity by assisting in the formation and function of the selenium-dependent glutathione peroxidases. Free from corn, dairy protein, lactose, eggs, gluten, wheat, nuts, yeast, soy protein, starches and salt. Free from artificial colours and flavours. Warning: This product contains selenium which is toxic in high doses. A daily dose of 150 µg of selenium from dietary supplements should not be exceeded.